I'm still trying to convince myself that summer's not almost over, even as the leaves are quickly starting to blush and the nights are turning so cold that we've had to add extra blankets to the beds (instead of turning on the heat - it's too soon for that!) It started off imperceptibly enough, with just the slightest hint of yellow in the top branches of the trees that line our street. But just yesterday, as I drove through the neighborhood I was shocked to see that the branches are suddenly more gold than green. When did that happen? And then the urgency struck. To make summer last just one weekend longer, just one day more. This is a curious new feeling for me. Year after year I welcome fall like an old friend. My best friend, in fact, for it is my favorite season. I trudge through summer with my eyes always on her, like a wanderer plods through a desert; her cool nights are the oasis that is often just out of reach. But not this year. No, she showed up on our doorstep unannounced at the end of August. Or so it seems. And I wasn't ready for her. However, despite the chill in the air and the changing leaves, the calendar still says it's summer, and I'm holding on to that as tightly as I can, for as long as I can. Because if the calendar still says it's summer, then it's still summer in my kitchen and as such, there's no shame in sharing one or two more summer recipes before time runs out, is there? 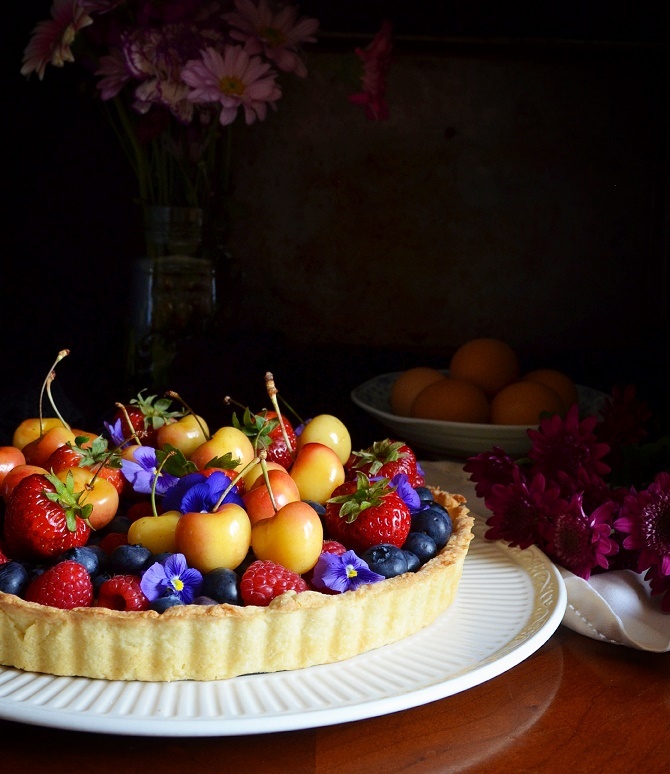 Like the seasons, I feel their time is slipping through my fingers, too, just as strawberries & cherries are too quickly being replaced by apples & figs (which, by the way would look just as pretty on this tart).